We may hear others' footsteps, but how do we ignore our own? A team of scientists has uncovered the neural processes mice use to ignore their own footsteps, a discovery that offers new insights into how we learn to speak and play music. The research is reported in the journal Nature. "The ability to ignore one's own footsteps requires the brain to store and recall memories and to make some pretty stellar computations," explains David Schneider, an assistant professor at New York University's Center for Neural Science and one of the paper's lead authors. "These are the building blocks for other, more important sound-generating behaviors, like recognizing the sounds you make when learning how to speak or to play a musical instrument." 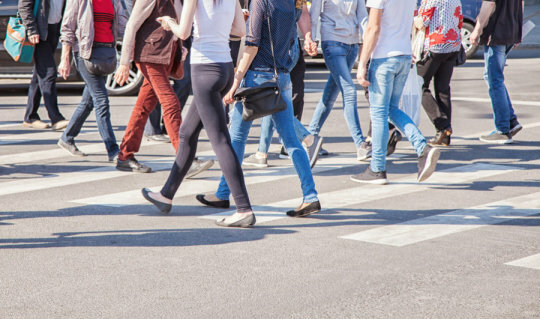 The research, conducted at Duke University's School of Medicine, centered on an intuition -- that we are usually unaware of the sound of our own footsteps -- as a vehicle for understanding larger neural phenomena: how this behavior reveals the ability to monitor, recognize, and remember the sound of one's own movements in relation to those of their larger environments. "The capacity to anticipate and discriminate these movement-related sounds from environmental sounds is critical to normal hearing," Schneider explains. "But how the brain learns to anticipate the sounds resulting from our movements remains largely unknown." To explore this, Schneider and his colleagues, Janani Sundararajan and Richard Mooney at Duke's School of Medicine, designed an "acoustic virtual reality system" for the mice. Here, the scientists controlled the sounds the mice made walking on a treadmill while monitoring the animals' neural activity, allowing them to identify the neural circuit mechanisms that learn to suppress movement-related sounds. Overall, they found a flexibility in neural function -- the mice developed an adjustable "sensory filter" that allowed them to ignore the sounds of their own footsteps. In turn, this allowed them to better detect other sounds arising from their surroundings. "For mice, this is really important," said Schneider. "They are prey animals, so they really need to be able to listen for a cat creeping up on them, even when they're walking and making noise." Being able to ignore the sounds of one's own movements is likely important for humans as well. But the ability to anticipate the sounds of our actions is also important for more complex human behaviors such as speaking or playing music. "When we learn to speak or to play music, we predict what sounds we're going to hear -- such as when we prepare to strike keys on a piano -- and we compare this to what we actually hear," explains Schneider. "We use mismatches between expectation and experience to change how we play -- and we get better over time because our brain is trying to minimize these errors." Being unable to make predictions like this is also thought to be involved in a spectrum of afflictions. "Overactive prediction circuits in the brain are thought to lead to the voice-like hallucinations associated with schizophrenia while an inability to learn the consequences of one's actions could lead to debilitating social paralysis, as in autism," explains Schneider. "By figuring out how the brain normally makes predictions about self-generated sounds, we open the opportunity for understanding a fascinating ability -- predicting the future -- and for deepening our understanding of how the brain breaks during disease."